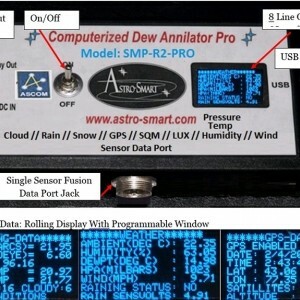 (SOLD SN4553299)Brand New Astro-Smart Astronomical Weather Station (SMP-R2-PRO) Sold! 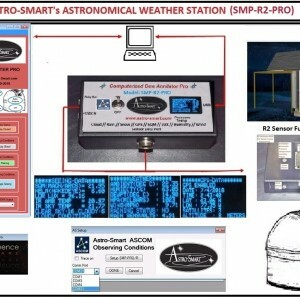 (SOLD SN4553299)Buy a brand new Astro-Smart Computerized SMP-R2-PRO Astronomical Observatory Weather Station Controller System(Model-SMP-R2-PRO) that includes an intelligent PC Software Platform GUI and ASCOM interface tested in Sequence Generator Pro including Sky Imaging SQM, Sky Lux Brightness, Cloud, Wind Speed/Direction, Barometer, Rain, GPS and Relay Output Alarm activation Designed for the astronomer that wants a full turn key astronomical sky sensor fusion monitoring capability. 1. Worry Free Warranty Program For Life Of Product Sale. 2. 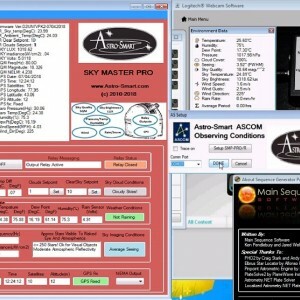 Full Computerized Solution With Controllable USB Remote Control Software Solution GUI and ASCOM interface. 3. 8 Line OLED Display of Sky, Weather and GPS sensor Data. 4. SQM Sky Quality + LUX Brightness Meter Sensor to measure Star Magnitude Per Arc Sec(MSPAS) and Naked Eye Star Magnitude(NELM). 0.2 mag/arc sec2 accuracy. The LUX reporting range of 0.0001 to 100K LUX. 5. 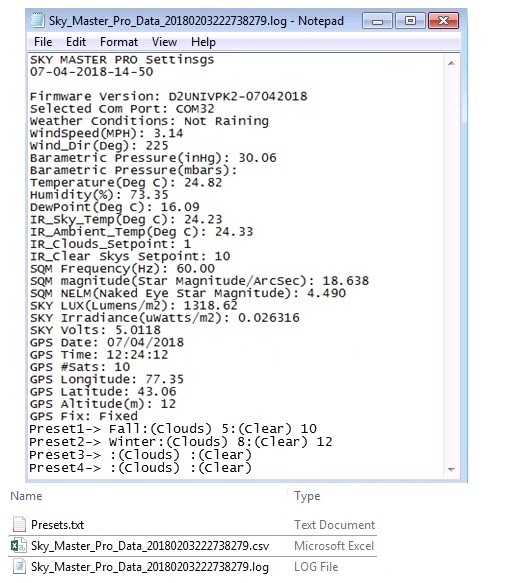 IR Cloud Sensor to measure Cloud Sky Conditions. 0.5 deg C accuracy. 6. WIND Speed and Direction Sensor in m/s or MPH +/-5% and 16 division scale direction accuracy for all measurements. 7. BAROMETER Pressure in mbars/inMg, Temperature, Humidity. +/- 1% accuracy for all measurements. 8. 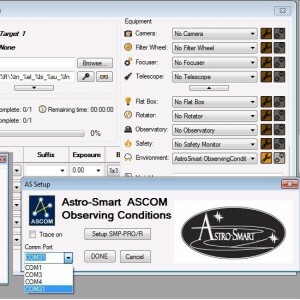 GPS Sensor (Lat/Lon,#Satellites,Date-Time and Altitude) to +/- 1 meter plus NEMA output option for 3rd party programs. 9. 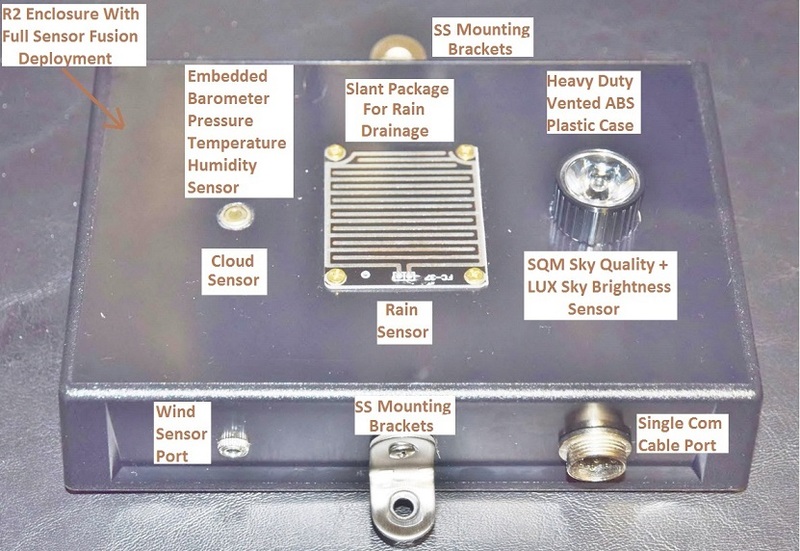 Rain Sensor with user select-able rain voltage threshold. 10. 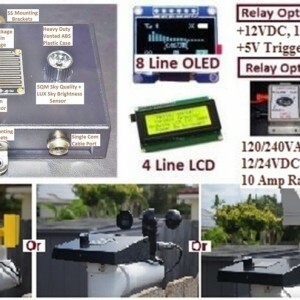 Relay Output Dome Roof Control or Power Utility with LED indicator and GUI Alarm indicator. Option1. 12VDC, 10Amp and +5VDC, 500 mA trigger to user relay on activation with 3.5mm jack style interface. Option2. 120/240 VAC 10Amp or 12/24 VDC 10 Amp relay with +/-AR terminal post style interface. 12. 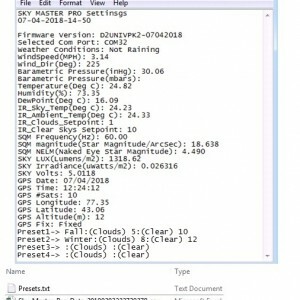 Alarms and Relay Control Rule Sets for Sky and Atmospheric Conditions. 13. Data Logging Capability with Parameter Setting Flash Storage And Retrieval. 14. 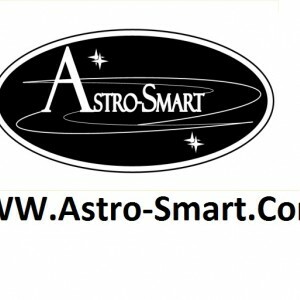 Free Firmware and SW GUI Updates For Life Of Product Sale. 15. Input Requirements: 12VDC – 2Amps. 16. Over-voltage, Over-current and Reverse Current Protection. Interfaces use 3.5mm jack and 4 pin DIN Aviation Locking Ring Plug Style Connectors. 17. Dimensions of SMP-R2-PRO (5.2"Length x 3" Width x 1.9" Height). 18. 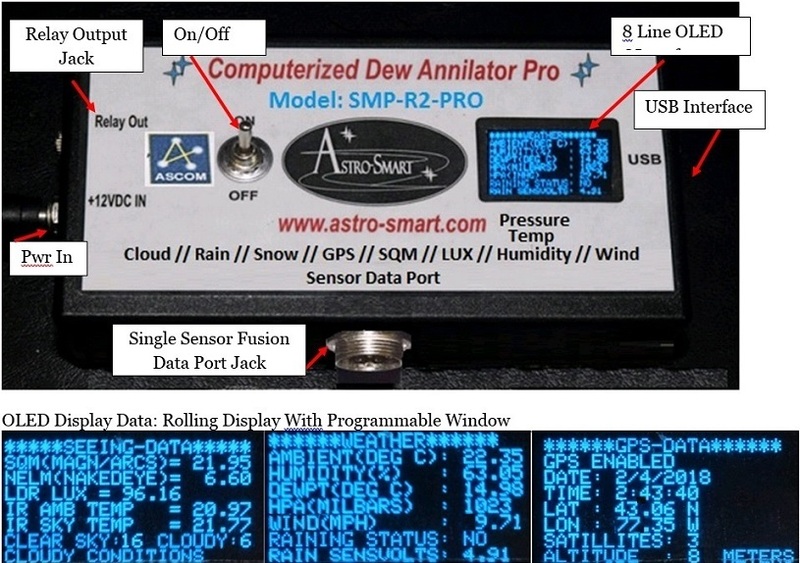 Dimensions of R2 full sensor fusion enclosure(6"Length x 4.5" Width x 1.3" Height). 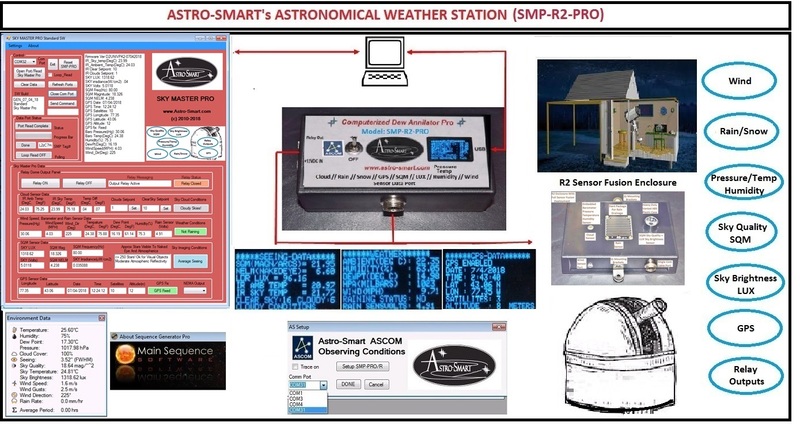 Astro-Smart Computerized SMP-R2-PRO Astronomical Observatory Weather Station Controller System (Model - SMP-R2-PRO) is designed to be user friendly, serviceable, elegant and reliable package including the following contents. 3. AC/DC Power Supply. Output: 12VDC 2 Amps. 4. 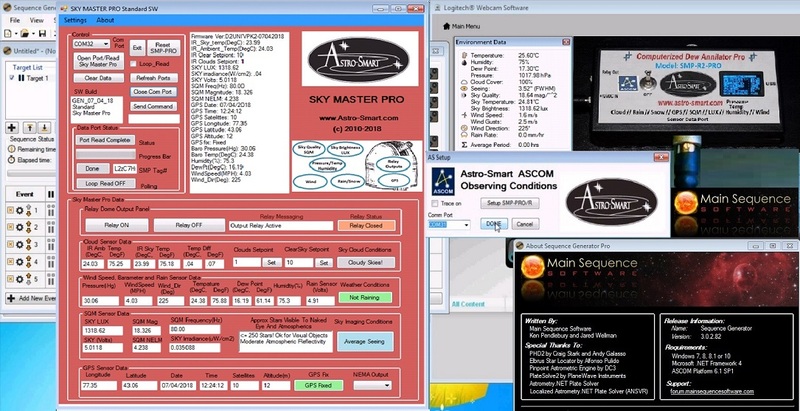 CD with user manual, SMP-PRO Remote Software Platform GUI with ASCOM Driver. 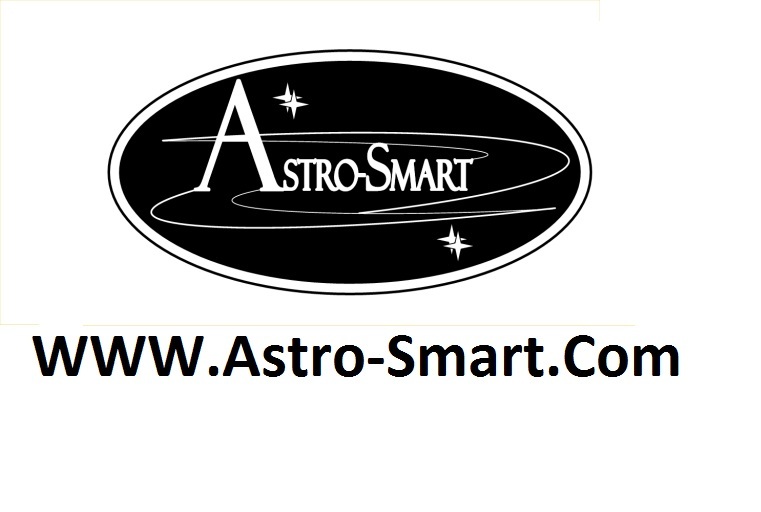 Please, feel free to ask any questions at dale@astro-smart.com. Our preferred method of payment is Paypal for your convenience. Clear Skys and thanks for looking.